Q What position do you play? Q What home club do you play for? Q What is your favourite memory of playing with College? Playing as a fresher with the senior team and qualifying for the Giles cup weekend in Belfast. Q What has been your best moment playing for County Team? 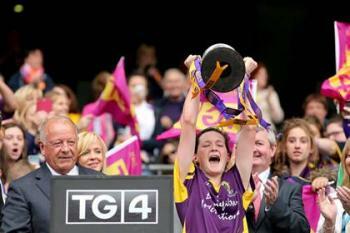 Walking up the steps in Croke Park as captain of the Wexford Ladies to lift the cup having won the 2014 all-Ireland final. Q What are the demands of playing county football? Strict regime with regard to fitness, diet, and rest. To be successful at anything you have to work hard. Q Do you feel as though it is worth it? Of course. To wear your county colours is an honour and when you get an opportunity to play for your county you have to grab it with both hands. Q Is it ever difficult to balance playing college football with county football? Communication between managers is essential. Burnout can be a huge issue but to get the best out of any player there has to be understanding from both sides. It can be difficult but thankfully for me there is a great relationship between both camps. Q How is confidence in the College squad at the minute for the coming championship? Really high. Itâs as good a squad that Iâve ever been part of and we are really looking forward to competing in Cork next weekend. Q What are your countyâs hopes for the coming season? Weâve just been promoted to the intermediate ranks so our hopes would be to definitely make a playoff stage in the national league and consolidate our place in intermediate. Q Have you ever suffered a long-term injury and how hard was it to cope with? Iâve been very lucky with injuries and have not had any serious injury in the last six years. Before that Iâd broken my collar bone on a couple of occasions and hated been a spectator. Q How do you think that support could be increased for ladies football? We are like a family. We are all so privileged to represent the college and would love to follow the success of the hurling, camogie and other sports. Q What is your earliest memory of playing ladies football? For my national school in Screen Mini 7âs. From there I was asked to join the club and thatâs where it all began. Q What would you most like to achieve as a footballer? Trophies and Rewards are a bonus but my hope would be to be as good as I can and play at the highest level for as long as I can. Q Do you have a role model in football? Kate Kelly. 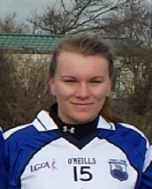 Although she is better known for her camogie she is an excellent footballer. Im so lucky to have got to play alongside her. Q Interests outside of football? Soccer when I get the chance. Q What makes a good player? Discipline, Hard Work, a desire to win and ability to listen and learn from those around you. Q What makes a good manager? An understanding of his/her players. An understanding of the game.